This puzzle is like a 4×4×4 Rubik's cube, where four non-adjacent 2×2×2 corner blocks are bandaged together. 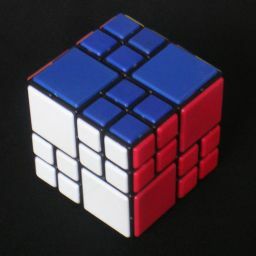 This means that generally the puzzle can only move like a 2×2×2 cube, except that when the four unbandaged corners lie in the same face then that face layer can be turned separately. We use one of the bandaged corners as a fixed reference point. The other 7 corners can be arranged in 7! permutations, and 36 orientations, just like the 2×2×2 cube. There are 12 edge pieces, and regardless of where the bandaged corners are, the edges have 12! permutations. These edges cannot be flipped. There are also 12 centre pieces, which occur in 6 identical pairs. These have 12!/26 distinct permutations. Putting that together, we have a total of 7!·36·12!·12!/26 = 13,172,009,005,028,966,400,000 positions. As usual, the six faces of the cube are denoted by the letters R, L, U, D, F, B, meaning Right, Left, Up, Down, Front, and Back. I will use these letters to denote a clockwise quarter turn of that face of the puzzle, which usually means moving half the puzzle due to the bandaging. The relevant letter is followed by a 2 for a half turn, or an apostrophe for an anti-clockwise quarter turn. When the four unbandaged corners are in the top half of the puzzle, then the top two layers can be turned individually. In that situation I will use a lower case u to denote a turn of the innermost of the two layers, with u2 denoting a half turn and u' an anti-clockwise quarter turn. The upper case U then denotes the movement of the single top layer. A move of both upper layers together will be denoted by (Uu), or (Uu)' or (Uu)2. Phase 1: Put the bandaged corners on the bottom, in any order and orientation. It is very easy to get three bandaged corners to be adjacent to each other. Hold the puzzle so that the three adjacent bandaged corners are in the bottom face, with the unbandaged corner at the front right of the bottom face. Turn U until the remaining bandaged corner is at the front left of the top face. Do F' to put all the bandaged pieces at the bottom. In the rest of the solution, I will make extensive use of a various short move sequences. Instead of repeating them each time, I will list them here. R F' R' F R F' R' F Alternative to the above. R2 D' R2 D R2 D' R2 D R2 Alternative to the above. I will refer to these sequences by the letters T, A, and O. Sometimes you need to do the inverse of T, denoted by T', but this can also be done by simply doing T twice. Phase 2: Build one 2×2×2 block. In this phase you will construct one complete 2×2×2 block at the front-left of the top layers. Examine the corner at the front left of the top layer. Find an edge piece that belongs adjacent to it, but which lies in one of the other 2×2×2 blocks. If no such edge exists, then choose any other edge. If the edge piece does not lie in the front-right 2×2×2 block, use either O or A to put the block containing the edge piece at the front-right. If the edge piece does not lie in the u inner layer, then use T or T' to make it so. Edge belongs at the front-left, below the corner: Do nothing. This has twisted the corner block so that the edge now belongs directly below the corner. Join up the edge with the corner by doing a u move. Repeat steps a-e until the corner has three matching edges surrounding it. Find a centre piece that belongs in the front-left block, but which lies elsewhere. If the centre piece does not lie in the front-right 2×2×2 block, use either O or A to put the block containing the centre piece at the front-right. If the centre piece does not lie in the front face, then use T or T' to make it so. Centre belongs at the front: Do nothing. This has twisted the corner block so that the centre now belongs at the front, to the bottom-right of the corner. Repeat steps g-j until all three face centres are solved, completing the 2×2×2 block. Finally, do (Uu) so that the first completed block lies at the back left. Phase 3: Build a second 2×2×2 block. Like phase 2, this phase solves the front left block, except that slightly different ways to insert the pieces are used in order to preserve the completed first block at the back left. If the edge piece does not lie in the front-right 2×2×2 block, then use A to put the block containing the edge piece at the front-right. Join up the edge with the corner by doing the move sequence u' A u.
Repeat steps b-f until the corner has three matching edges surrounding it. If the centre piece does not lie in the front-right 2×2×2 block, use A to put the block containing the centre piece at the front-right. Repeat steps h-k until all three face centres are solved, completing the second 2×2×2 block. Phase 3: Build the top half of the third 2×2×2 block. Do (Uu)' A so that the first two completed blocks lie diagonally opposite each other and lie at the front left and the back right. The unsolved blocks are at the front right and back left. Examine the corner at the front right of the top layer. Find an edge piece that belongs adjacent to it, but which lies in the other unsolved 2×2×2 block. If no such edge exists, then choose the edge that lies directly below the back-left corner. This has twisted the rear corner block so that the edge now lies directly below the corner in the u inner layer. Use T or T' to turn the front-right corner such that the sides of the corner that match the chosen edge are at the bottom. If you did not find a matching edge in step b, then just twist the corner block so that any incorrect edge lies below the corner. Join up the edge with the corner by doing the move u2. Repeat steps b-e until there are two matching edges adjacent to the front-right corner. Use T or T' to twist the front-right corner block so that the two matching edges are on the top. Do U2 to bring the matching corner and two edges to the back-left. Find a centre piece that would fit with those matching pieces to form a complete 2x2x1 block. If that centre piece lies in the back-left block, do u2 to bring it to the front-right. Use T or T' to twist the front-right corner block so that the centre piece lies in the front face. Insert the centre piece with the move sequence (Uu)2 T U2 T u2 T' U2 T' (Uu)2. If the previously solved front-left and back-right blocks are not solved, do u2 to fix them. Phase 4: Solve the last four edge pieces. Hold the puzzle with the half-solved corner block at the back-left, and the unsolved corner block at the front-right. If the back-left edge in the u layer matches the corner above it, then use T or T' if necessary to twist the front-right corner block so that one of its non-matching edges lies in the u layer, and then do u2. Look at the colours of the back-left edge in the u layer. Use T or T' if necessary so that sides of the front-right corner piece with those two colours lie at the front and right faces. Do u2 to match the back-left edge to the front-right corner. Repeat steps b-d until all the edges in the front-right block match the corner. If the previously solved front-left and back-right corner blocks are no longer solved due to the u2 turns, then do the move sequence A u2 A u' to fix them. Phase 5: Solve the last five centre pieces. Find the face centre that belongs at the back of the back-left corner block. Find the face centre that belongs at the left of the back-left corner block. If all three face centres of the front-right block are incorrect, then S or S' will put them in place. 1. Do T or T' if necessary so that both of the incorrect face centres lie in the u layer. 2. Find a side of a different corner block has the same colour either of the incorrect face centres. 3. If that side is not on top (in the U face), then hold the puzzle so that that corner is at the front-right and do T or T' to put that side on the top. 4. Hold the puzzle with the two incorrect centres at the front-right. 5. Turn the U face to bring the other centre to the front-right, so that now the front-right block contains not only the two incorrect centres but also a third one of the same colour. 6. Do S or S' to cycle the three face centres to match their adjacent edges. 7. Turn the U face back again so that all corner blocks are solved. Phase 6: Solve the cube. Use any 2×2×2 solution to solve the cube.